Photos from a Healing Waters trip with some Vets from S. Carolina. On June 1st, the second phase of the raceway construction project will begin. That means that we will be closing the hatchery down to visitation again. We will be blocking the hatchery parking lot off again and all stocking will be done downstream of the hatchery. Please be careful when travelling on Rock Creek over the next few weeks. We will have concrete trucks and steel trucks coming in and out of the road during the construction. If you have any questions please feel free to call the hatchery (706-838-4723) or contact us on Facebook. We need about 10-12 folks to trim and remove limbs from over the creek so fishing will be better/easier for Trout Camp. If you can/will help, please let me know at knc615@windstream.net. Bring loppers, clippers, small tree saws. We will be in the water so wear waders or wet wade as you desire. Meet at 9 AM at the fields by Betty Creek across from the Dillard House entrance. We’ll have coffee, water and snacks. We will be through before noon. Ricky sees his future after graduating high school as continuing into college. He would like to be guiding and teaching others how to fly fish and to share the sport he loves. Let's change to Thursdays for these 2 months because of Trout Camp & July 4th. Chattahoochee Riverkeeper, in collaboration with Brenau University and the University of North Georgia, is thrilled to bring the Wild and Scenic® Film Festival to Gainesville GA on Saturday, May 30, 2015. The Wild & Scenic® Film Festival inspires people and unites communities to conserve and protect our natural resources. Join us to witness environmental and adventure films that illustrate the Earth’s beauty, the challenges facing our planet and the work communities are doing to protect the environment. Through these films, Wild & Scenic will inform you about the state of the world and inspire you to take action. Light refreshments and delicious Sweetwater beer will be served before the screening and during intermission. Door prizes and raffle items will also be a part of the event. Come prepared for an evening of fun and inspiration. For more information, or if you are interested in sponsoring this event, please contact Duncan Hughes, Headwaters Outreach Director, (770) 531-1064 or dhughes@chattahoochee.org. 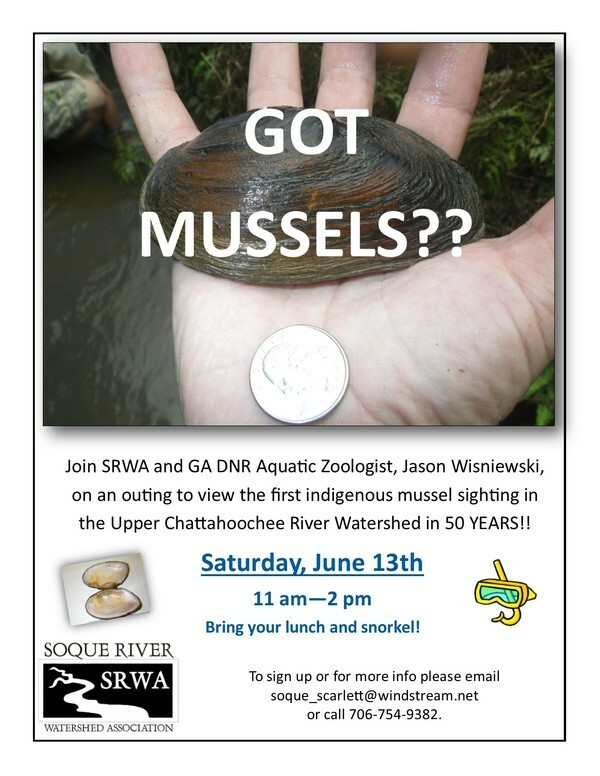 Most folks have no idea that the Soque River Watershed is host to the first indigenous mussel populations sighted in the Upper Chattahoochee River Watershed in the last 50 years. It's a pretty cool honor. This summer outing will get us out in Hazel Creek with a professional aquatic zoologist from the Georgia Department of Natural Resources to answer questions about these mussels and why it's such big deal that we find them in our watershed. Pack a lunch and snorkle if you want to get up close and personal with the mussels. The event will be held from 11-2 pm on Saturday, June 13th. Email Scarlett at soque_scarlett@windstream.net or call 706-754-9382 to sign up and for directions. The fourth annual Georgia Mountains Farm Tour will be held Saturday, June 27th and Sunday, June 28th from 1-6 pm. This event provides a unique opportunity for the general public to visit over a dozen working farms in the Northeast Georgia mountains and see sustainability in action. Weekend passes cost $30 before June 17 and $35 after June 17. One day passes cost $20. For details or to purchase a pass online, visit GMFN's website here, email Andrew at gmfnfarmtour@gmail.com or call 503-758-8488. We have two volunteer opportunities available and YOUR help would be MUCH appreciated!! If you have previous writing, editing or interviewing experience or just a keen interest on helping us develop these and other topics to be included in the "Soquee River Days" book please email Scarlett at soque_scarlett@windstream.net or call (706) 754-9382. You can view the "Soquee River Days" website to see some of our content HERE. Not a writer? That's ok! We need help moving a very nice (and FREE) oak desk from Duncan Bridge to our office in Downtown Clarkesville. As you know, we lost nearly everything in the office FIRE just over a year ago and we are still rebuilding our office inventory. We have been gifted with yet another generous donation of an office desk. We need 3 or 4 strong hands for an hour or so to help move this SOLID OAK desk onto a trailer at Satchel Storage on Duncan Bridge and then unload it at our office in Clarkesville. YOUR help is GREATLY appreciated!! To volunteer please email Scarlett at soque_scarlett@windstream.net or call (706) 754-9382. Donations to the Soque River Watershed Association (SRWA) are tax deductible. What is the 11-Mile Challenge? The 11-Mile Challenge is a simple concept. TU’s Southeast Conservation Project can reconnect 11 miles of brook trout stream with our work to replace old and outdated culverts with modern, fish-friendly structures. 11 miles isn’t much when you are driving, biking or even hiking, but what about fishing? 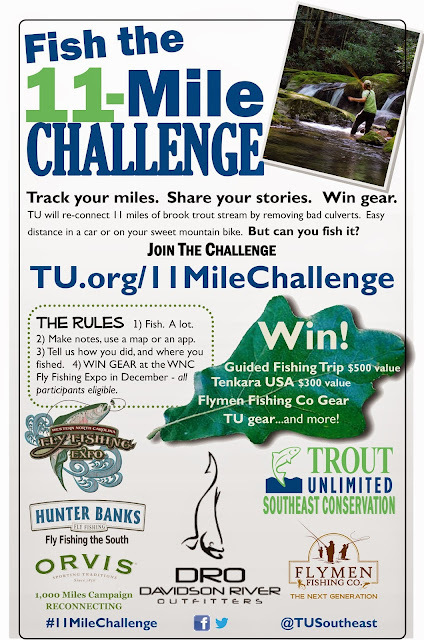 We will enroll anglers in the challenge and ask them to track their angling miles, share photos and stories, and best of all, win some awesome gear this fall. In the process, we will engage the angling community with the goal of diversifying membership, giving members a reason to connect with TU and their Chapters, and raising awareness about the importance of stream connectivity for native trout. 2. Fish on any trout stream. 3. Track your actual fishing miles using pen and paper or get high tech with apps. 4. Share your stories with TU staff using email or social media, like Facebook. 5. All participants are eligible for gear and prizes and we will celebrate participants at the WNC Fly Fishing Expo in Asheville December 5-6, 2015. It’s free to sign up and prizes include a guided fishing trip with Davidson River Outfitters for 2 ($500 value), a Tenkara USA outfit from Hunter Banks ($300 value), Flymen Fishing Co. gear, and great TU gear. The importance of the Challenge is two-fold. The Challenge will raise awareness about the accomplishments of TU’s Southeast Conservation Project and heighten TU’s presence on social media—an important tool for recruiting young anglers for membership and participation. Second, the Challenge will help the TU project and chapters in the region connect with members, and hopefully increase their level of participation in TU activities and fundraising (at chapter and national levels). Participate! This will only work if we get people participating—this starts at the chapter level. Sign up at www.tu.org/11mileChallenge . You can email me, Tara, with questions any time at tgranke@tu.org. There are more detailed instructions on how to participate on the website. · Print out the attached poster and put it up at meetings or anywhere you see fit (stream side info stations, outfitters, community centers, libraries, etc). · “Like” us on Facebook at www.facebook.com/TUSoutheast and follow us on Twitter or Instagram @tusoutheast. · Repost our Facebook entry: log on to your Chapter’s Facebook account, and then search for TUSoutheast – once on our page, find a post about the 11-Mile Challenge, and then click “Repost” and promote it on your own Facebook page. · Paste the content of the sample newsletter article into your Chapter Newsletter and use the Challenge graphic too. · Email this packet out to anyone you think might be interested. Thank you and have fun with it! Great "Dark Thirty" program presented by Pat Hopton at last nights Foothills meeting. Our annual Kid's Day celebration will be on Saturday, June 13th, 2015 from 10:00 until 2:00 PM. We have a critical need for volunteers for this event. Listed below are the needs that we currently have, # of volunteers needed, and a short description of requirements. Please look our list over and see where you can help out. Smithgall depends upon it's amazing volunteers to make things happen! Giving out general information, selling raffle tickets, greeting people. Explain the Jr. Ranger Program, give children the booklets! Need someone to assist Craig Woody with cooking. Need someone to serve (make plates, drinks, watermelons cut and handed out. All materials supplied. Instructions too! Simple educational games that the kids will enjoy! This will be a "kid" guided hike of the Visitors Center Loop. It will happen at 10:30, 11;30, 12:30 and 1:15. Just a short hike with entertaining age appropriate facts for the children. Several runners or relief volunteers need also! Please feel free to call me at 770-561-0021 or at 706-878-3087 for more information or to sign up! Please also feel free to respond to this email!